The goal was to insert a separating zipper in the jacket I'm making. The jacket is constructed of one of my thick, luxurious rippled jacquard knits. It all worked out, but here's what I was dealing with. 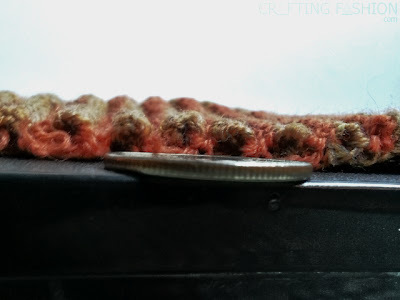 The pic below shows the thickness of the rippled jacquard fabric. Though my lens isn't exactly level with the quarter, you can still get an idea of how thick this fabric is. What I love about my rippled jacquard is that it's full of air pockets, which makes it warm, and the fabric is enormously squishable, if that's a real word. There's no problem with running this material through my serger or sewing machine. Getting it to hold a crease for zipper insertion, however, is undoable. Even basting the "folded" edge first, before inserting the zipper, did not give me the desired look. Eventually, after a couple of false starts, as you can see in the top pic, I was able to insert the separating zipper into the jacket with a facing. Once I figured out the method, the procedure went easily. As I mentioned in my first zipper post, I went with the "zipper sandwich" method. Here's the step-by-step of how I did it. Step 2. 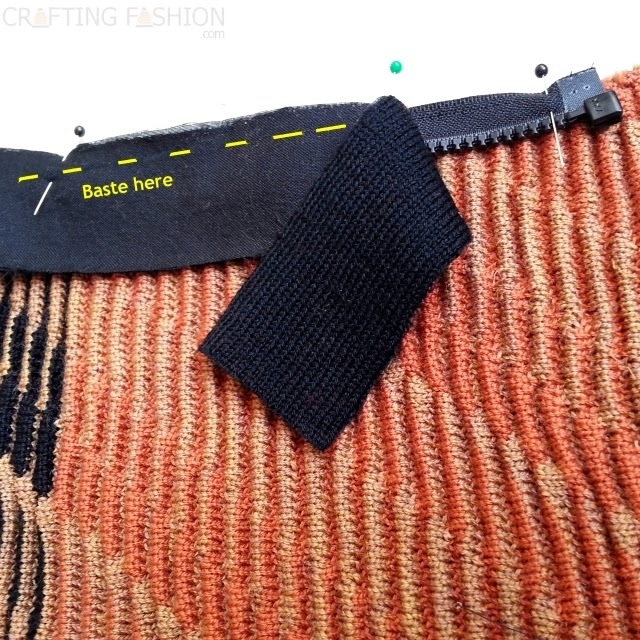 Determine the placement of the zipper and mark top and bottom with pins on one side of garment. Step 3. Make the zipper sandwich. Bottom layer -- Garment fabric is right side up. 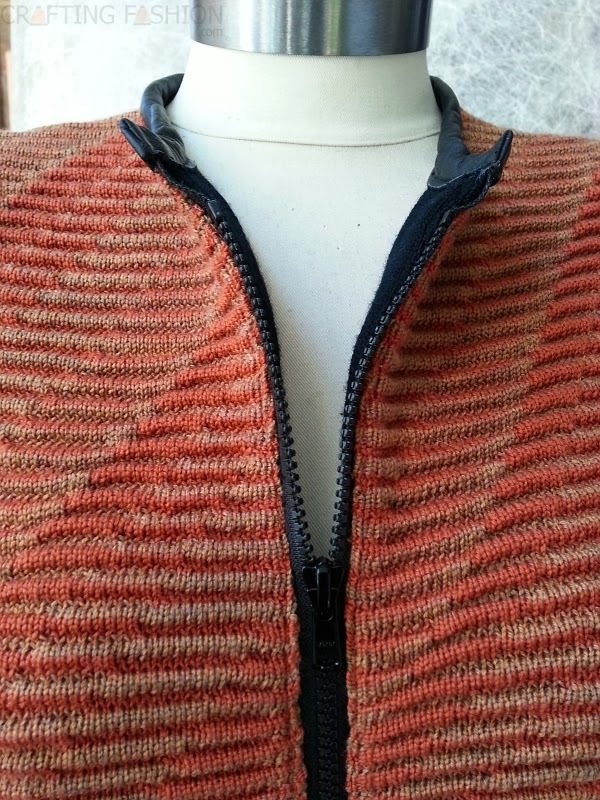 Zipper layer -- Zipper is right side down. (Garment fabric and zipper are right sides together.) Edge of zipper tape is lined up with edge of garment, teeth point away from edge. Step 4. Pin layers in place and baste. Glue basting did not work with the this highly textured garment fabric. My machine basting was sloppy. Hand basting did the trick this time. Step 6. Assemble the zipper. 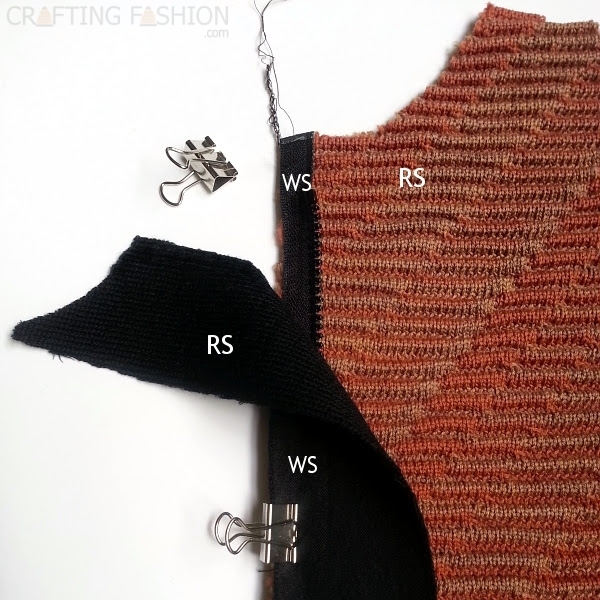 Place in position and pin to other side of garment. Mark placement for top and bottom of zipper. Step 8. With sewing machine, sew through all layers (facing, zipper, and garment) on each side, next to basting and close to the edge. Step 9. Turn and steam well. 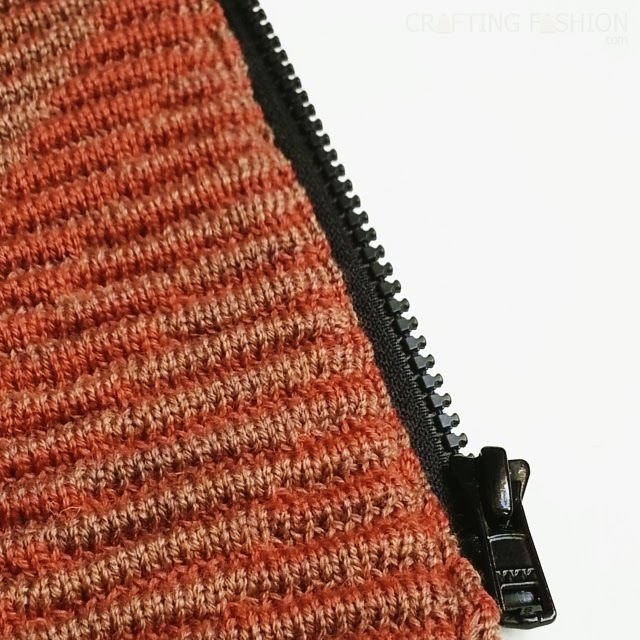 Remove basting stitches. Step 10. On right side, top stitch close to where garment fabric meets zipper tape. I'm pleased with the zipper and will use this method again, even if the fabric isn't so thick. This looks really great! Your knit is super thick - whoa. You are definitely going to get a lot of wear (and compliments!) from this jacket. What did you use for your facing? A jersey knit? Congrats on your zipper insertion! Hey, maybe I can make an oversize old sweater of mine into a jacket by using your technique. Hmmmm. I'll have to ponder that. Thank you, Chuleenan! I machine knitted a plain jersey for the facing and backed it with a light fusible interfacing. 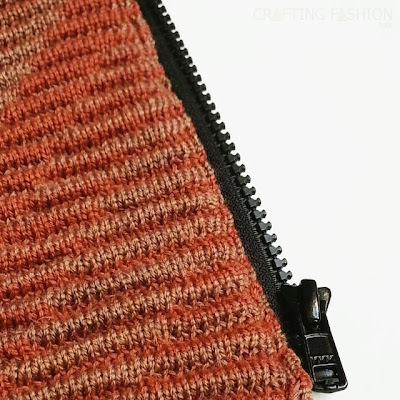 Great idea to re-fashion your old sweater! Please let me know how it goes, if you end up doing it. I've had the sweater for a while - gift from one of my sisters years ago - very oversized - so at one point I put it in the washing machine to "felt" it. So it's thick. I was thinking of turning it into a cardigan but I like the zipper idea. I'll have to pull it out and look at it again to see how it would look. Cool that it's felted so the fabric won't fray or run. Just be sure that all layers fit under the presser foot!